Protecting, preserving, and enhancing vision are the combined goals of Nevada Eye Consultants. 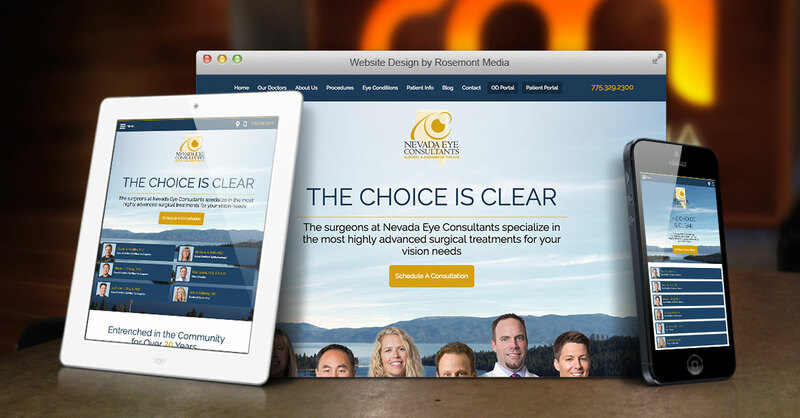 To help achieve these objectives, the Reno LASIK and eye care practice reached out to Rosemont Media to develop and build a customized site that current and prospective patients could access with ease from virtually anywhere. The mobile-device-friendly responsive website features a concentrated selection of appealing components, from leading design elements to patient-focused attributes. Furthermore, the site is flush with detailed medical content on LASIK eye surgery, cataract surgery, and other leading vision correction procedures to help visitors become well-informed. Other patient-centered particulars include homepage hover states (buttons that appear when you hover over a graphic), which reveal each eye doctor’s name and credentials. This feature emphasizes the training and experience of the distinguished team, granting patients a greater feeling of comfort and confidence in their treatment. Another small but meaningful built-in aspect is the ability to adjust text size to suit varying levels of vision quality. No factor, however minor, was overlooked in the creation of the Nevada Eye Consultants’ practice website, as is the case with their approach to vision care. To see what a modern, tailor-made website from Rosemont Media can look like, please visit www.nevadaeye.com.